If you take a walk along King’s Mill Lane to the reservoir, then just before the outfall, on the left, is a stone viaduct with a date stone of 1817. This is one of the oldest railway viaducts in England, and last year, 2017, was its 200th anniversary. 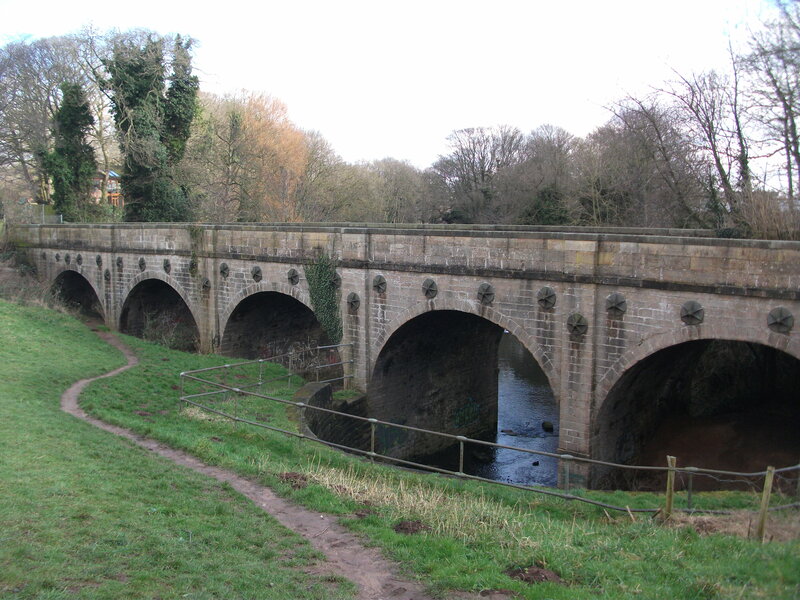 The viaduct was part of the Mansfield to Pinxton Railway, which was the subject of the Mansfield to Pinxton Railway Act passed on 6th June 1817, although the railway itself did not open officially until Easter Tuesday of 1819. 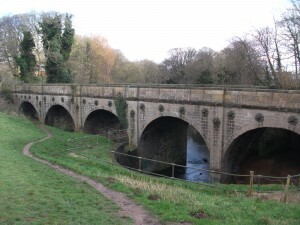 The line was 7 3/4 miles long, and gave Mansfield a connection to the Cromford canal at Pinxton Wharf. The track had stiff gradients and sharp turns, the trucks being drawn by horses up to the summit at Kirkby and then allowed to roll under their own weight ! Initially there were no regular passenger services, but then trucks were temporarily converted with rudimentary seats to take passengers to Mansfield on market days. Around 1832 a covered, horse-drawn, four-wheeled carriage was built and The Boat Inn at Pinxton ran a regular weekly passenger service between Pinxton and Mansfield, again on market days. Despite being impossible for steam engines to negotiate, the tonnage of goods carried was quite considerable, totalling over 57,000 tons during 1834, of which 50,000 tons was coal and coke. Other goods carried were sand, stone, timber, metals and manure ! The viaduct never carried locomotives because of its tight curves, and this was its downfall. The whole line was purchased by Midland railway in 1847, and in 1849 was modernised, which involved straightening the line and building a new viaduct, originally of wood but later of stone, the latter still in use today. The original viaduct is well worth a look, and has a wide roadway. 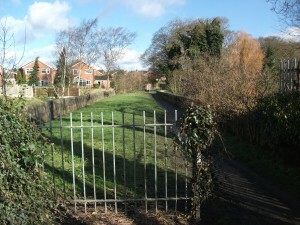 The line of the original track can still be made out as it curves to join the current railway track, although it is now only a footpath. The Mansfield/Pinxton Railway was opened in 1819, and in celebration of the 200th anniversary a Project Group has been formed to ensure that the heritage of this line is remembered. The Group comprises of members of Kirkby and District Archaeological Group, Pinxton and S. Normanton History Society, Old Mansfield Society and Sutton Heritage Society, with Denis Hill as Chairman. The aims of this Group are : To research the modern history of the line. To hold a series of events to celebrate the anniversary. To produce a series of Interpretation Materials. To carry out archaeological research on aspects of construction. Funding is being sought from the Heritage Lottery Fund, Network Rail etc. The Group was only formed during the summer but is already collecting material and coming up with ideas on how to celebrate the anniversary. If you have any thoughts or ideas then please get in touch with any of the Society’s officers shown on the Contacts page of this site.